The Washington Water Power Co, announced that it was ready to purchase the property of the bankrupt Spokane Heat, Light and Power Co. – which we know today as the Steam Plant. The plant, with its iconic towers, was built in 1916, but it quickly ran into financial trouble. 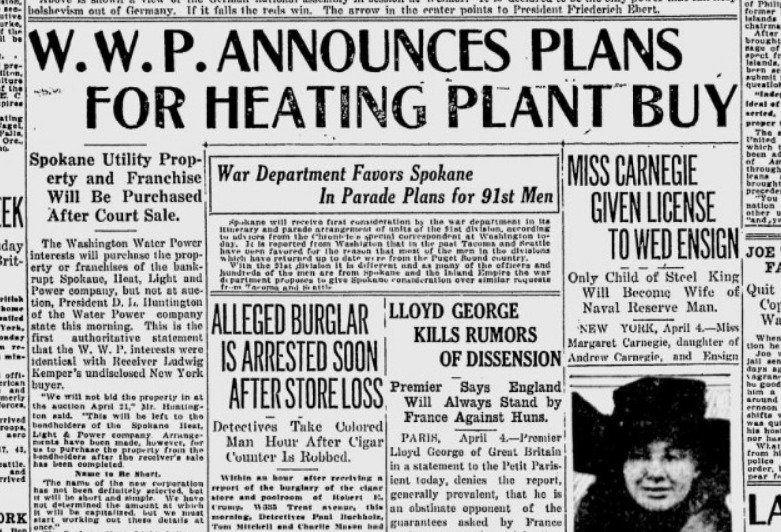 Washington Water Power would complete the purchase before 1919 was out. Washington Water Power would later evolve into Avista, which still owns the Steam Plant. Now it is a popular restaurant, with retail and office space. From the crime beat: Clinton A. Lathrop was sentenced to life in prison for killing his wife and seriously injuring his stepdaughter. From the commerce beat: Spokane was enthusiastically embracing the fad of gum-chewing. The American Chicle Company said that 7 tons of chewing gum had been ordered in Spokane over the next month. That was double the amount from a year ago. A representative said that 1919 was the largest gum-producing year ever recorded.